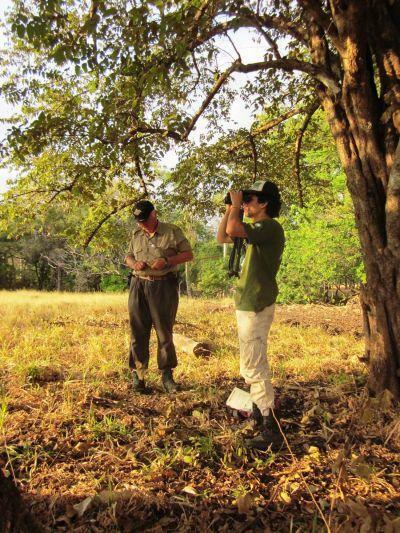 'As each month passes we are gradually increasing the rhythm of the Macaw project so that eventually, when we reach April/May we are there 24 hours a day 7 days a week. This month we have been visiting twice a week at times and have even finished coordinating for night time visits as well. The main times that we need to be watchful for poachers is during the night, so we are hoping that our presence will be noticed from now on and will persuade people not to bother the nests this year. We have not seen other people around the area so far this year, and we are confident that the farm hands, the people living at the entrance to the farm and the farmer himself will talk about the group of volunteers who are coming into the farm each week to look after the nest which will also act as a deterrent. It hasn't all been plain sailing this month though, we are fairly sure that nest 2 has eggs now but nest 1 is still behaving a little strangely. On a couple of occasions this month we have not seen the birds until 5pm, when they flew back from what looks like the Tempisque river area. This is a strong indication that there is nothing to protect or look after in the nests and on another day we even saw a group of wasps trying to make a nest inside the Macaw nest! 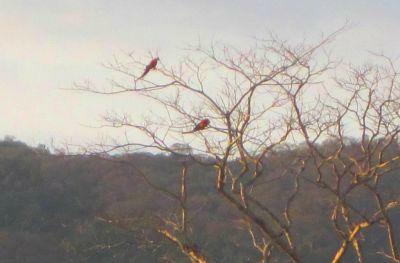 Luckily we saw the Macaws return and clean the nest out quickly before the end of the day so we are fairly sure that they will lay soon.